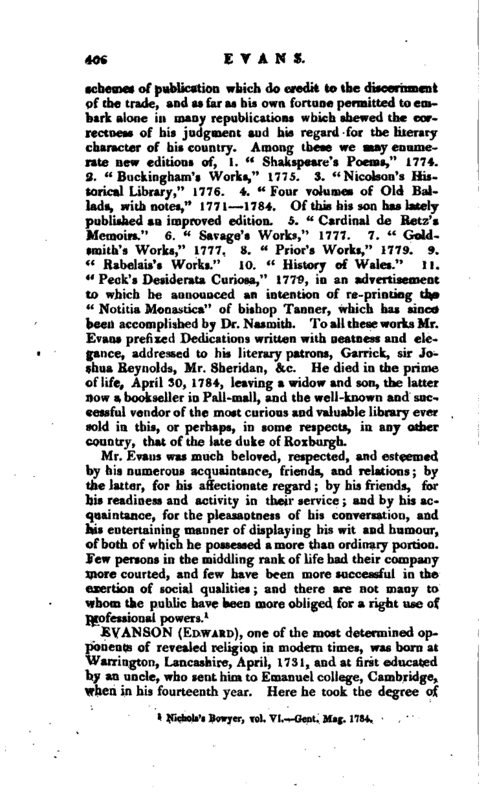 , a bookseller of London, and deserving notice not only for spirit and integrity in business, but for considerable literary taste and talents, was born in. 1742, and served his apprenticeship with Mr. Charles Marsh, a bookseller of reputation in Round-court, Strand, and at Charing-cross. 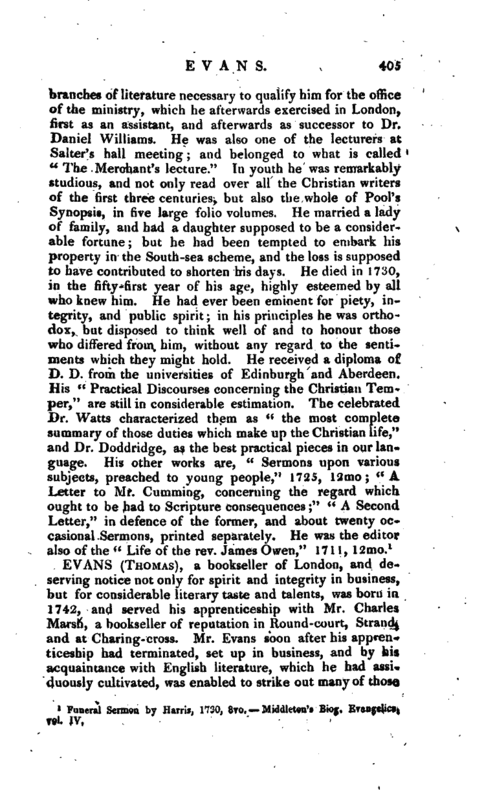 Mr. Evans soon after his apprenticeship had terminated, set up in business, and by his acquaintance with English literature, which he had assiduously cultivated, was enabled to strike out many of those | schemes of publication which do credit to the discernment of the trade, and as far as his own fortune permitted to embark alone in many republications which shewed the correctness of his judgment and his regard for the literary character of his country. Among these we may enumerate new editions of, 1. “Shakspeare’s Poems,” 1774. 2. “Buckingham’s Works,” 1775. 3. “Nicolson’s Historical Library,” 1776. 4. “Four volumes of Old Ballads, with notes,” l?7l 1784. Of this his son has lately published an improved edition. 5. “Cardinal de Retz’s Memoirs.” 6. “Savage’s Works,” 1777. 7. “Goldsmith’s Works,” 1777. 8. “Prior’s Works,” 1779. 9. “Rabelais’s Works.” 10. “History of Wales.” 11. “Peck’s Desiderata Curiosa,” 1779, in an advertisement to which he announced an intention of re-printing the “Notitia Monastica” of bishop Tanner, which has since been accomplished by Dr. Nasmith. To all these works Mr. Evans prefixed Dedications written with neatness and elegance, addressed to his literary patrons, Garrick, sir Joshua Reynolds, Mr. Sheridan, &c. He died in the prime of life, April 30, 1784, leaving a widow and son, the latter now a bookseller in Pall-mall, and the well-known and successful vendor of the most curious and valuable library ever sold in this, or perhaps, in some respects, in any other country, that of the late duke of Roxburgh. Nichols’s Bowyer, vol. VI. —Gent. Mag. 1784.